AFJROTC (Air Force Junior Reserve Officer Training Corps), a citizenship program offered at nearly 900 high schools worldwide, prepares High School students to become outstanding citizens. AFJROTC emphasizes “life skills,” and will help prepare students for success following High School, but there is never a military obligation. Our cadets learn the type of discipline, leadership, and social graces that allow them to acquire a finely-tuned body and mind. They are taught valuable time and stress management skills as well as note taking and study/test taking techniques. Completing the AFJROTC program is no easy task; but, for those who have the drive and the passion to succeed, AFJROTC is the gateway to building a successful career through diligent preparation that must start in high school. 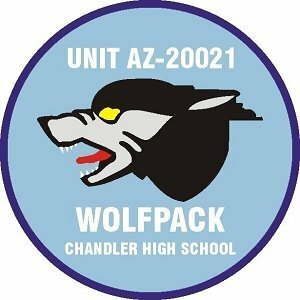 Since 2002, Chandler High School AFJROTC has been developing high quality citizens of character who are dedicated to serving their school, community, and nation. Some of the best and brightest Chandler High students have completed the AFJROTC program while earning their high school diplomas. These graduates have gone on to become successful, productive community members, military members, and college students. In fact, we are very proud of our 100% AFJROTC Senior class graduation rate. Today, this long-standing tradition continues at Chandler High School. AFJROTC offers students a chance to challenge themselves more than they ever thought possible. Our commitment is first and foremost to help cadets succeed as students. In the Corps, cadets gain access to resources that can help them excel academically. Through the Corps of Cadets, students have the opportunity to excel as a leader through participation in a premier values-based program. All programs in the Corps are cadet initiated, planned, led, executed, and documented, providing them the opportunity to operate and learn at the “ownership” level. The shared experiences of cadets creates lifelong bonds. AFJROTC introduces students to a diverse section of the student body, perhaps many of whom they will remain in contact with long after graduation. We understand that parents play an important role in guiding children through life’s decisions, offering the benefits of wisdom and experience. We want these decisions to be informed decisions for both you and your student. Accordingly, we hope that you’ll consider encouraging your Chandler High School student to enroll in AFJROTC; we are confident you’ll be glad that you did. If you have any questions, we’ll be happy to provide you with the answers you need to make an informed decision. Please feel free to call us and/or check us out on the web at chandlerrotc.com.